Immigrants are already under attack and demonized in the current political climate, but they are exceptionally vulnerable when they are arrested and ensnared in the criminal legal system for any reason. While recent administrations have latched onto the notion that "criminal aliens" deserve deportation, a system as sprawling, racist, punitive and error-prone as our criminal justice system cannot serve as a reliable measure of who deserves to stay or be forced out. Call on your local lawmakers to protect immigrant communities. The entangling of federal immigration law and local law enforcement rips apart families and communities and undermines the local administration of justice without making us safer. An arrest for even a low level offense can lead to ICE arrest, indefinite detention, and deportation proceedings for immigrants who are documented and undocumented. When accessing public transportation without paying, marijuana possession, or a dismissed criminal case can separate you from your family and banish you from the the country, the punishment far exceeds the crime. For those who lack legal status in the US, have immigration applications pending, are here as visitors or students, or think they're U.S. Citizens but the government disagrees, simply getting arrested can mean federal detection, detention and deportation — even if the alleged crime is minor, or the case is ultimately thrown out. For those who have legal status in the US, like a green card — an arrest is also profoundly dangerous. A conviction, even for a low-level or non-violent offense like possession of marijuana, can lead to deportation, denial of re-entry into the US or denial of any future chance at citizenship no matter how long you've been in the country. The truth is that immigrants commit crimes at far lower rates than native-born citizens. Our neighbors, families and friends, who are presumed innocent, with no criminal records, or with decades-old arrests, have become victims of a deportation machine that is identified more by its inhumanity than by any measure of justice or fairness. Who are these so-called "criminal aliens?" Women and children, parents and grandparents, undocumented and documented, refugees and asylum-seekers. Immigration and Customs Enforcement (ICE) targets target some of our Nation’s hardest workers and the most marginalized among us. Regardless of how you feel about border security, the reality is many immigrants are here and have lived in the US for years or decades. They have American families. They run American businesses. They serve in the American military. They pay taxes, even those who are undocumented. They also are central to the administration of our local justice systems — serving as police officers, correction officers, witnesses, informants, jurors and first responders. Aggressive, arbitrary and racially-motivated immigration policies damage American institutions. ICE has been rounding up long-time legal permanent residents regardless of how old their conviction is, whether they were sentenced to any jail time or whether they completed their sentence long ago. ICE also exaggerates or altogether invents gang affiliations to broaden their enforcement umbrella, including targeting the victims of gang violence. ICE went so far as to undermine a long-term FBI investigation into MS-13 by arresting and detaining a former teenage gang member, who was risking his life to help gather evidence for them. ICE plugs into state and local law enforcement databases to obtain personal and biometric information about anyone arrested by local police. This lets ICE target immigrants in their homes, workplaces or even by seeking them when they voluntarily appear at their mandatory local court appearances. Alex Lora has been A green card holder since the age of. 7. He has been in the United States legally for 25 years. In 2009, he pleaded guilty to a drug offense. A year later, he was arrested by ICE. He was detained for 6 months without a bail hearing. The life he created for himself and his family, including a young son, was nearly ripped away. Increase in nationwide captures by ICE in 2017. Increase in arrests nationwide by ICE of those with no criminal record. Increase in raids by ICE in NYC courts. Daily average population in immigration detention nationwide. Since 2017, we have seen a dramatic increase in immigration enforcement through local justice systems, using local police, jails, or courthouses, including housing and family court, to hunt immigrants. There has been a 1200% increase in ICE arrests in local courthouses. These operations-conducted in plain clothes without identification-undermine local justice and put people at grave risk. ICE even comes to courthouses to arrest witnesses and/or victims. View video of a recent ICE courthouse arrest. 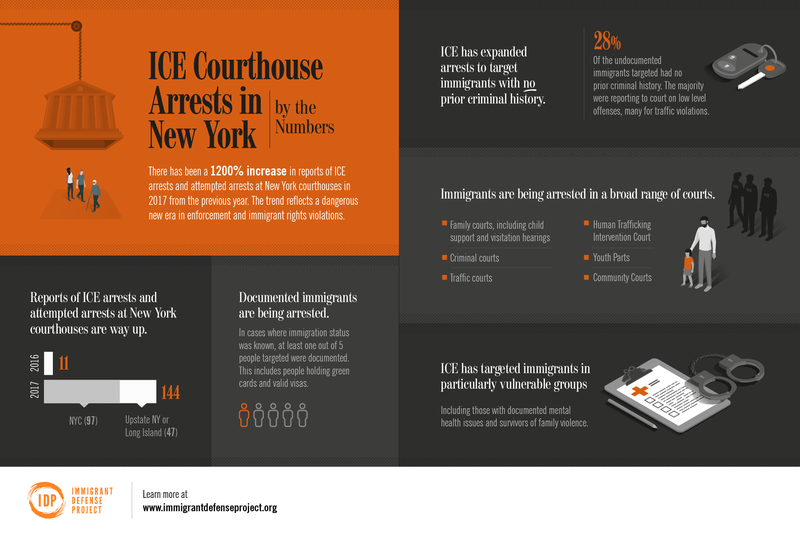 The New York State Bar Association found that ICE enforcement in Court has "had a dramatically chilling effect on immigrants’ willingness to avail themselves of the justice system and the protections of the Courts." Public defenders, immigrant rights organizations, and grassroots coalitions have come together to draft and support the Protect Our Courts Act, a bill that will ensure access to state court proceedings for all regardless of immigration status. The federal authorities claim they are making America safe again, but their immigration enforcement policies are making all of us less safe. Unlike criminal defendants, immigrants facing deportation have no right to a lawyer, no right to a bail hearing pending their proceedings, and no right to a speedy trial. The Non-Existent Right To Counsel in the U.S.
As immigration enforcement has grown exponentially harsher and more expansive, the right to counsel in immigration proceedings remains non-existent. Unlike in criminal court, immigrants do not have a constitutional right to appointed counsel, and must either hire private counsel or hope for representation from extremely limited nonprofit and pro bono programs. As a result, thousands of immigrants every year face deportation alone—whether they are elderly, are children as young as 2 and 3, know how to read or write, speak limited English, or have serious mental or physical illnesses—while on the other side of the courtroom, a trained ICE lawyer sits to advocate for their deportation. The result: Regular miscarriages of justice as people are routinely ordered deported without knowing that they might have had strong claims to asylum or permanent residence, or that ICE’s charges or evidence against them were insufficient. By comparison, when immigrants are represented by excellent, trained counsel, people are vindicated and released to their families, and courts issue decisions acknowledging the due process rights of immigrants. America needs humane immigration reform. A smart, compassionate and sustainable approach to answering the millions of global citizens escaping violence, crushing poverty and environmental degradation and who seek opportunities in the US. One that’s consistent with our rich and successful history of welcoming immigrants. In the meantime, we work to defend and protect our clients, their families, and their communities in encounters with immigration enforcement. Help pay an immigrant’s filing fees for documentation. Empower immigrants by viewing & sharing the “We Have Rights” Campaign explainer videos. Support law that will allow immigrants to drive to and from work, open bank accounts, sign up for car insurance, and feel less afraid when reporting crime. Have you, a loved one, or a client experienced the intersection of criminal and immigration enforcement? Whether you’re a fellow public defender or other frontline practitioner, or directly impacted in some way way by the system, we’d love to hear from you. Hassan, an immigration attorney, tells how a trip to the DMV turned into the nightmare of separation and deportation. Khalil tells the harrowing story of near deportation despite being a green-card holder for a decades old crime. Paul got caught up in the cycle of violence and incarceration. Then almost got sent back to a country he didn't know. Jailed in immigration detention for 6 months without a bail hearing. Charged with endangering her children for briefly walking downstairs to get a bottle of formula for her baby.